The J B • GROUP Classic stands to go down as the most successful tennis event in Hong Kong’s history. The event, which attracted six of the world’s top 11 stars, has exceeded previous records for ticket sales. "It's a sign of the desire of the people of Hong Kong to see these stars compete, and the crowds have contributed enormously to a thoroughly enjoyable event,” he added. The tournament has also been hailed as an unqualified success by the J B GROUP, the Hong Kong-based multinational, who took on the role of Title Sponsor for the first time to celebrate 15 years of growth and expansion from their base in the SAR. . The tournament’s status was boosted this year by superstars Maria Sharapova and Venus Williams announcing that they were using the J B • GROUP Classic as their final warm-up for the Australian Open, the first Grand Slam of the year. "Both Venus and Maria have said how much they’ve enjoyed themselves this year,” said Wade. the President of the Hong Kong Tennis Patron’s Association who organize the tournament. U.S.Venus Williams raises the trophy after defeating Russia Maria Sharapova during their final at the JB Group Classsic 2008. Williams won 6-4, 6-3. Russia Maria Sharapova waiting the award presentation ceremony after she was defeated by U.S.Venus Williams in their final at the JB Group Classsic 2008. 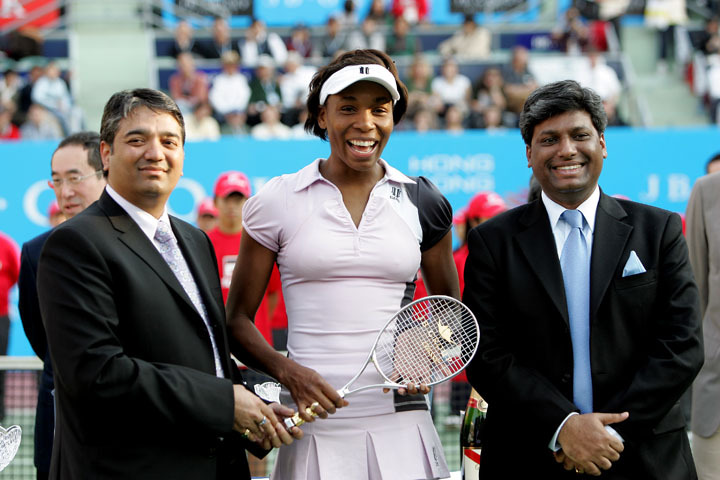 VIP and Maria Sharapova, Venus Williams attends the award presentation ceremony at the JB Group Classsic 2008. CHINA Peng Shuai smiles after defeating Caroline Woznaicki in the final of the JB Group Classic 2008. Peng won 6-2, 4-6, tie-break 10-6. CHINA Peng Shuai poses with the trophy after winning her match against Caroline Wozniacki of Denmark at JB Group Classic 2008. Peng won 6-2, 4-6, tie-break 10-6. VIP and Peng Shuai, Caroline Woznaicki attends the award presentation ceremony at the JB Group Classsic 2008.